From time to time we encounter an artist or producer toiling away at something pretty special. Here’s what they have to say, in their own words, about their work. 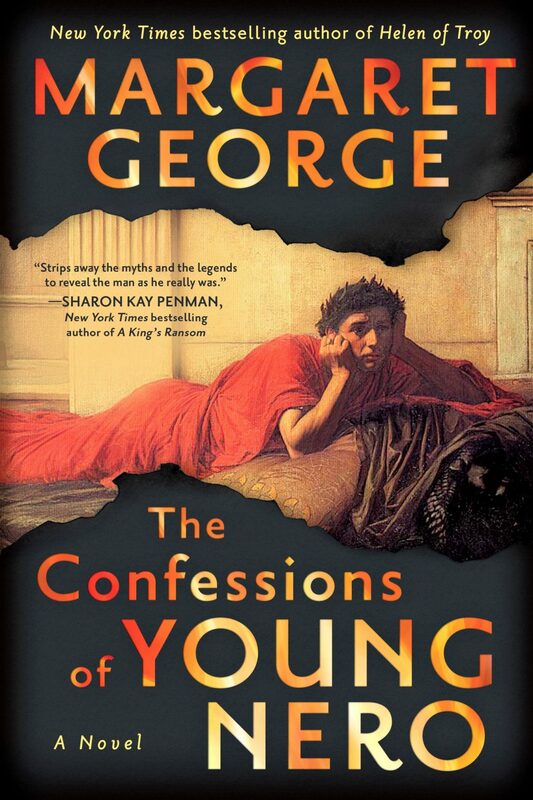 WHO: Margaret George writes biographical novels about outsized historical characters: Henry VIII, Mary Queen of Scots, Cleopatra, Mary Magdalene, Helen of Troy, and Elizabeth I. Her latest subject is covered in ‘The Confessions of Young Nero’ and ‘The Splendour Before The Dark’. Her novels have been ‘New York Times’ bestsellers, and the Cleopatra novel was made into an Emmy-nominated ABC-TV miniseries. Margaret especially enjoys the research she has done for the novels, such as racing in an ancient Greek stadium, attending a gladiator training school in Rome, and studying the pharmacology of snake poison. Why Nero, well it’s because I think of all the Roman emperors, he seems more like a person that you know. He seemed very modern. He reminded me of so many people I know personally who want to be artists. How many people do you know like that? Children, they want to go to film school, they want to become playwrights, they want to write novels, they want to play music and their parents say “No, I really think you’d better go to law school”. In this case, so many people were killed to make Nero Emperor, it was kind of his destiny. He couldn’t opt out of it. I felt that was what really made him so interesting to me. It made his character alive in a way that say, Septimius Severus or even Julius Caesar or any of those people, they didn’t have that other side. That is where I got the idea of the three Neros from. The Augustus one that did his duty, the artist in him and, last of all, the third one that had to facilitate the other two. I felt as if I’d known Neros – I’ve known a lot of Neros in my life, maybe I’m sort of a Nero too because I was lucky that I could write novels and make a living as an artist, but so few people can. Of course, this was a real life story so it wasn’t up to me to come up with a plot for the sequel that was as good as the first one because history has provided me with that plot. It was a tragedy, of course, I notice that I seem to be drawn to tragic figures because when I think about it, so Mary Queen of Scots was executed, Cleopatra and Nero committed suicide, Helen of Troy caused a war where lots of people got killed and I just seem to be drawn to this, ‘cos life is sad even if you’re an emperor. I like to do novels that really do have a whole life. I think that you can’t understand the adult until you’ve met their younger self. The modern thing is to do just a slice of the life. When I started out I wanted to do Henry VIII. At the time most of the books and plays just spoke a sort of small part, usually the Anne Boleyn part and / or the Thomas More part – but I thought, “well you can’t understand those out of context, you have to know the person, how he grew up, what formed him, you can’t just leap into the middle of his life.” That’s what people do now, because of space, I think, which is understandable, but I think you wouldn’t know the grown-up Nero until you knew the child. How did you find writing the story in the shadow of Robert Graves’ I, Claudius novels? One thing I am thankful for though is that ‘I, Claudius’ is told from Claudius’ point of view. Thank goodness Robert Graves didn’t get to do too much about Nero, because I find myself, especially from a mini-series, I just can’t get out of my mind, you know, the images I have of those people that played those roles, I mean you know Livia will always be Siân Phillips and of course Caligula will always be John Hurt. Had there been a continuation with a grown-up Nero, I would certainly have had trouble in battling that image in my mind. Neither of us do, do we? That’s funny. You know there’s such a difference of opinion about Seneca. He’s kind of a mystery. It’s the old problem – stay within an institution and try to improve it, work from within and do what you can, don’t desert the field; or do you quit like Thomas Moore and say, “I just can’t have anything to do with this.” Seneca chose the first one, though he’s criticised a lot for that. Was he really part of a conspiracy plot or not? You can make a case for the fact that he tried, he didn’t desert. But you can also make a case that he stayed because he was getting so fabulously rich. Is rehabilitating the reputation of Nero the ultimate act of iconoclasm? I found that people are the most resistant to rehabilitating Nero. More so than they were to Henry VIII, which is kind of surprising because Henry was so much closer to modern times. I do think that what I found in some of the reviews, and some of the comments, are that people really prefer the villain. I have a friend who’s trying to rehabilitate Richard III, but it’s really hard because that colourful kind of villain is so attractive. Even in my Mary Magdalene book, Maureen Dowd in the ‘New York Times’ said that we prefer the golden-haired prostitute because she’s so visual, she’s so easy to identify. The disciple is not as interesting. I’m glad I did it but I think I was a little naïve in thinking that I could change many people’s thoughts about Nero. I have to say I can see now how entrenched these ideas are about, him. They recently did a programme, a kind of rehabilitation, it was called ‘The Nero Files’ and I braced myself. It was about a forensic scientist who examines the case against Nero and what came out was that he didn’t do a lot of these things and we can prove it by this, that and the other. I wish a lot of people had watched it, I hope they did. But they don’t think that happened. I decided that even if it wasn’t really true, it was so much in the popular mind that there had to be a version of it that involved him and in effect he caused it by an accident. I couldn’t just get away with the modern view that she was ill and she had had a miscarriage – which was what my editor wanted me to do. I said, “no” because you have to answer the criticism. I did feel that the only way to answer it, without being accused of just dodging the whole thing, was to have it happen but have it not being a central thing. I say in my author’s afterword that Nero was not known to personally do physical things against people. So it’s a bit out of character. Plus he loved her very much. There’s even a papyrus, a poem written in Egypt afterwards, about Nero and Poppaea and their love. If he went around striking people, I could say okay, but there’s no other evidence. That’s one of the problems of being a historical novelist, a real historian can say here are the theories: one, two, three, four and he can put them all out. But, if you’re writing a novel and it has to be consistent, you can only choose one, just one, not one you call ‘a’ and one you call ‘b’. So, that’s the way I handled it. As for the fire in Rome and the one thing that you really can’t get away with, his killing Agrippina. I mean that’s the thing that, you know, you know it happened. The only way you can handle that is, as I say, to ask what were the reasons for it? Do you have a role in selecting the narrators of the audiobook editions of your novels? Long, long ago when they still had cassette tapes, remember? I would be driving my daughter to school, college and it was a two-day drive and so we would go to the library and get all these tapes but we always had to preview them because if we didn’t like the sound of the narrator we knew we couldn’t stand listening to it. It would take up room in the car, because we had to bring it back to turn back into the library. That’s really where I got the idea that you’ve got to preview these things. Sometimes the narrator just isn’t right. After a certain point in my publishing career, I got the rights to select the readers and that makes such a difference. If someone doesn’t sound like Nero or doesn’t sound like what I think he sounds like, I think that it just won’t capture the spirit of the book. I think it’s because I really wanted the main characters to be British – because everybody knows that the ancient Romans spoke with British accents. I think she just sounded like an older kind of canny woman, the other two readers, they had sounded either really spacey or weird or else way too prissy to be like Locusta was, really this kind of wise, I think it was older but very level headed and practical kind of person so I hope it wasn’t too jarring that she had a different accent. Since Peter Ustinov is unavailable, who would you cast to play your Nero? People think of Nero as so much older. Every time I give a talk and I say, “you know he didn’t live – he died when he was 30”, people are shocked. They have no idea. I’d like the young Robert Redford, but the current actor I came up with is Joe Alwyn. He’s 28, he looks like the young Nero, and of course, he’s British so he has the right accent. I thought it was brilliant Zeffirelli casting ‘Romeo and Juliet’ with actual teenagers. You get these older actors playing these teenaged parts. Since the death of Luke Perry, there’s been a lot of stuff about ‘90210’. The actors playing those parts of teenagers were not teenagers. One woman was 30 and Luke Perry himself was 26 so I think that if you really want to get the real Nero, you better ask an actor who is that age and so Joe Alwyn is my choice and I hope he is available! If he’s not taken up with Taylor Swift! But yeah I think he’ll be perfect but we’ve got to do it right away or he’ll soon be too old. No not yet. I do have an agent in Hollywood who is working very hard to find a way of bringing it to the screen because you know the streaming services, like Amazon of course and Netflix and now Apple is going to get into the mix, they are budgeting huge, billions of dollars, to bring out new series. So I’m hoping that in this climate that there will be an interest in this because of course, a mini-series is so much more than a two-hour movie. I don’t see how you could get Nero into a 2-hour movie but you know we’ll see what happens. It’s a good time for these things. Did Nero’s rule produce any lasting achievements? That was also a good question. I’m not trying to dodge this, I’m just framing it a little bit, whether anybody has real lasting achievements. It’s very rare because often the person’s accomplishments, at least within a couple of centuries, get superseded or wiped out. Nero had great diplomatic success with that dream of peace with Parthia. That lasted 50 years. Longer term, I would say the beginning of urban planning. He was the first one because he had to after the fire of Rome. He had a clean slate so he did put in the urban plan the green spaces. The new streets had to be a certain width. They had to have fire fighting equipment and the walls had to be at least a yard apart no more common walls, and you had to build on a certain kind of stone that was much less susceptible to fire damage. Of course, these weren’t popular but he could mandate them because he was the emperor. We accept this now. Of course, you must have city planning. I just got a new copy of ‘National Geographic’, I was reading it last night. They have a whole issue on cities and planning cities – what the Chinese did wrong in the last 30 years and Los Angeles did wrong in the last 15 years. How do you shape urban spaces in cities? How do we learn from past mistakes so that we have pleasant places to live? I’d say that urban planning is Nero’s one legacy which he would be very surprised about. I think he was proud of it but it kind of came to him by accident because of the fire. It’s not that he set out saying, “I think I will redesign a city.” He was too focused on a different kind of art. I would also say maybe preparing the way for Hadrian was an accomplishment. Nero is a bit ahead of his time. Later, Hadrian could grow a beard and he could be a Grecophile and he could be gay, be all kinds of things that Nero did and was pilloried for. If you could possess any one item associated with Nero, what would you have? I would like to have his very own cithara, I could have thrown it in some kind of shrine because we don’t have any left and it was a very difficult virtuoso instrument to master. I’ve seen the statues of Apollo holding it and that way it’s like 3D and you can walk around it and see how big and boxy and bulky it was but I’d like to see the real thing. I do have some things from Nero’s time, I have coins which I have collected and I do have some jewellery from that era that is wearable. That I love having ‘cos I think someone wore it when Nero was emperor. I have learnt so much about history through my coin collecting. I did it with Cleopatra too. So if you could ask Nero any question what would it be? I assume by your question that that means he’d have a retrospective vision. Because if he knows what’s happened since I would say I would ask him for an honest appraisal of his art. Would he make the same choices knowing how posterity has painted him? He would have to know how posterity painted him, I suppose if it was when he was alive, I would still ask him toward the end of his life, you know because I have him in the book saying, “Do I care enough to throw everything over for my art?” At the very end, when I say do you think – if you can go back and do it all over again, will you throw everything over for your art? You’ve got a one way ticket to the Roman Empire for you and your family, you’re not coming back, when and where are you taking them? I’m never coming back? Then I would go to England at the time when Hadrian was building his wall, and it’s okay for me to stay there because my ancestors were all there. That’s one reason I want to go, seriously, but the whole thing about the Roman Empire in Britain fascinates me. It’s odd even that Britain ever was in the Roman Empire, it was for 400 years so it’s a bit like the EU. Were they ever really and truly in their hearts part of it? What was it like to be living there then? I’d like to see Roman Britain kind of at its height. I want to live in one of those heated villas and that’s why it’s a mythological place almost, that whole time. I remember my father saying years and years ago when I was writing Henry, he said you know you want to do a novel about the end of the Roman Empire in Britain because they just upped and left and it must have been very strange to have this suddenly happen for both sides. Of course, I would go earlier when things were just getting underway. So that’s what I would do but I better take some warm clothes. You’ve got a solo return ticket for either a year on campaign with Julius Caesar; a fortnight with Hadrian and his entourage at Tivoli; or a day in the library of Alexandria. Which do you pick? I wouldn’t take the library because I said I’ve spent so much time in libraries, I’m sure I’d have a great time with Hadrian and his entourage but I would choose the Julius Caesar campaign. Now I hope, because I’m being magically transported back in time, I hope this would also mean that I could keep up with the campaign and it wouldn’t be me as I am now. I would go as a ramped up version of myself. I got very fascinated by Caesar when I saw him through Cleopatra’s eyes when I was writing about them. You know he’s such an extraordinary character and I care about what a genius he was with his campaigns and also in one particular, he was easy going in a way, in the sense that he was tolerant of his soldiers. When some of them ran away, he grabbed them by the shoulders, turned them around and said, “the enemy is this way.” He didn’t kill them, he was quite, you know, unique and I would just like to watch him in action. Also, it’s the beginning of Europe too, you really kind of think about the Roman Empire in a time when Europe was all wild and you know when Augustus, that is Octavian and Antony, split up the Roman Empire? Well, Octavian got the bad part, he got Europe, it was still very wild. Antony got the rich part, the Eastern part. So, the beginning of Europe with Caesar, I would take that. Well, I’m really thinking about, I would love to stay in the ancient world and as I said I really have a draw to Britain and Roman Empire Britain. I think I would like to stay in the ancient world and I haven’t quite decided you know, who is calling. I kind of get called by these characters and I’ve got some, a few voices, but I’m not sure which one is absolutely the loudest. So I will demur on that until I know for sure.